Norma Faye Anderson, born to William and Alma Lee on June 21, 1932. Jesus called her home on April 8, 2019 to receive her eternal crown. She had a special step-dad Dep Maynard, who raised her and brought her to Jesus Christ. She had two sisters Willette and Jean, one brother, Billy who died at birth; 3 nieces and 2 nephews. She devoted her life to Jesus Christ and was an encouragement to all she met. 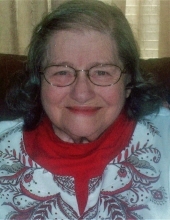 She was a long- time member of Southgate Church of Christ. Norma married Billy Ray Ruth and was blessed with five children: Ronnie Ruth, Ricky Ruth, Linda (Ken) Pope, Cindy (Gordon) Miles, and Billy Ruth. She had 11 grandchildren and 14 great grandchildren. And a very special friend, Dori Jones who is considered family. Norma met and married Russell Anderson and shared 20 years together and she was able to lead him to Jesus Christ. She worked for Standard Times and Ft. Concho Museum. Norma will truly be missed by all that knew her. The family will receive friends for visitation from 6:00 P.M. – 7:30 P.M., Wednesday, April 10, 2019 at Harper Funeral Home. The Funeral Service will be 2:00 P.M., Thursday, April 11, 2019 at Harper Funeral Home Chapel. Interment will follow at Fairmount Cemetery. "Email Address" would like to share the life celebration of Norma Faye Anderson. Click on the "link" to go to share a favorite memory or leave a condolence message for the family.